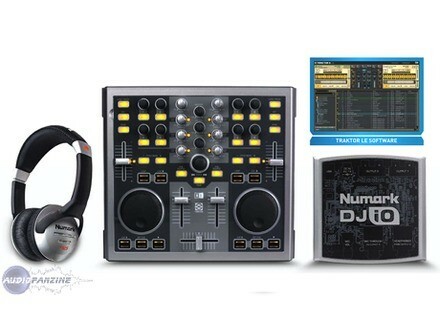 Total Computer DJ in a Box, DJ Package from Numark. Numark announces that Total Computer DJ in a Box is now shipping. 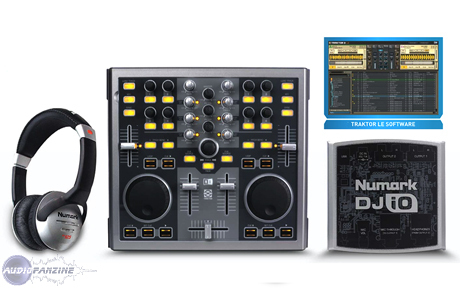 Total Computer DJ in a Box is a package consisting of Numark's Total Control DJ controller, DJ|iO audio interface, HF125 DJ headphones and Native Instruments' Traktor 3 LE DJ software. DJs can mix and scratch on Total Control, the scratch control surface designed expressly for computer DJs. DJ|iO enables DJs to get audio into and out of their computer for connection to PA system and for cueing with the included professional-grade HF125 headphones. The system is compatible with Mac and PC computers. Total Control is laid out just like a DJ mixer or CD player, with scratch wheels, line faders, EQ knobs and a crossfader. Learning on Total Control enables DJs to move to any other DJ system with ease. Thirty-one buttons, 20 knobs and five faders give DJs powerful control capability, while USB powering frees DJs from the tethering of a wall outlet. Total Control is compatible with most DJ software and comes with pre-mapped controls for Traktor LE with no programming needed. DJ|iO is a compact, rugged computer interface that gets audio into and out of a DJ's computer on a USB connection. It has a microphone input, two sets of RCA outputs and a headphone output to handle all audio system connections. CD-grade, 24-bit, 44.1/88.2 kHz audio powered by ultra-low-latency ASIO drivers gives DJs the sound they expect from Numark. HF125 DJ headphones feature seven-position adjustable earcups housing large 40mm mylar speaker drivers, a six-foot tangle-resistant cable and padding on the headband and earcups. Total Computer DJ in a box is now shipping to DJ and pro audio retailers. It carries a retail price of $649.00. Numark PT-01USB Numark announces the release of PT-01USB portable vinyl archiving system. The PT-01USB permits users to listen to and transfer their vinyl records to digital MP3 files. Mixed In Key 4.0 Mixed In Key LLC, in conjunction with Allen & Heath, presents Mixed In Key Version 4.0. Native Instruments Traktor Pro Native Instruments announces TRAKTOR PRO and TRAKTOR SCRATCH PRO.